Baron Motorcycles, Inc. is a manufacturer and importer of motorcycles, scooters and ATVs. Were located in Plymouth, MN. 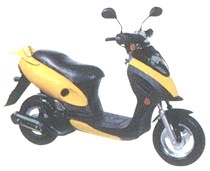 All our bikes meet or exceed DOT requirements and our 150cc engines have been tested and certified by EPA. Were seeking dealers in the United States for distribution of our products. Our dealer prices are very competitive and our quality is unmatched. Our bikes are shipped in semi-disassembled or fully assembled state. Drop shipping is available. Copyright 2004 Baron Motorcycle Company. All right reserved.